February 21, 2018 at 11:46p.m. 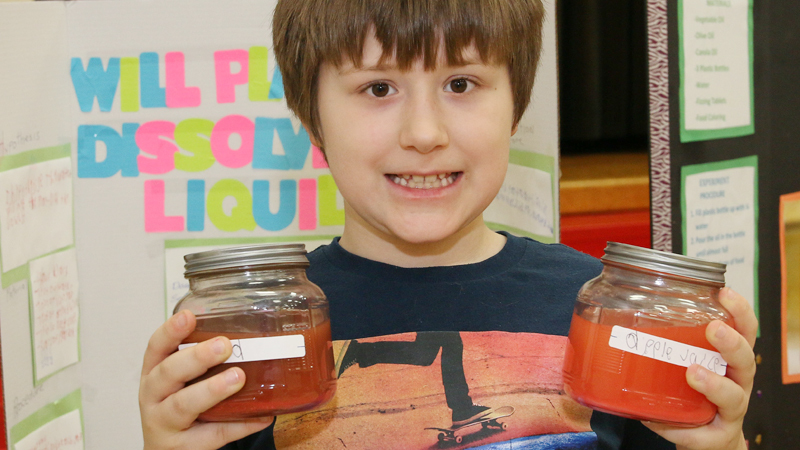 Joshua Dixon Elementary students showed off their science skills at the annual fourth-grade science fair. The Wednesday afternoon event had teachers and students discuss with parents how each student personalized steps to the scientific method for their respective projects. Poster boards in the school gymnasium contained how each student asked a question, made a hypothesis, tested with experiments, analyzed results and formulated a conclusion. For the science fair, students chose their own topics, which included whether bottled water or tap water best grew plants; whether lemons or potatoes result in the most voltage; and whether petting a dog, listening to music or playing a game lowered heart rates the fastest. Student Peyton Stoy proved her hypothesis that petting a dog lowered heart rates the fastest. The process, Peyton explained, was to have her test subjects sit down and stand up until their heart rates rose, then try the three methods listed previously to lower their heart rates. That’s one of best things about the science fair, Gorby said. And the work led students to other hypotheses about their projects. Student Alexis Sperling measured voltage in lemons and potatoes, proving lemons had the highest voltage. “Looking up the volts was interesting to see how many everyday objects have,” Alexis said. From that conclusion, Alexis said it’s likely the lemons have the most voltage because of their water content. “Lemons have a lot of juices, but potatoes are drier,” she explained. From her new hypothesis, Alexis can test fruits with more water concentration against those with less, she said. February 21, 2018 10:55 p.m.
January 31, 2013 12:04 a.m.